With a history as storied and exciting as the MINI® itself, M7 Tuning has long been recognized as the premier source for MINI® performance parts and accessories. 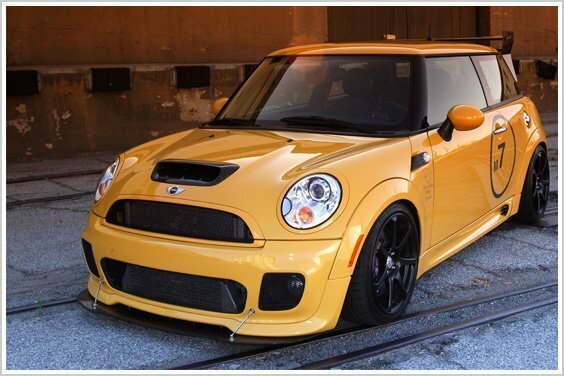 M7 Speed is the premier and largest aftermarket MINI Cooper performance parts manufacturer on the Planet. Originally founded by Southern California car enthusiast Peter Horvath in 2002, M7 is now located in Mooresville North Carolina. M7 Tuning is now based in the heart of American racing. From our new base of operations in Mooresville, NC, M7 is at the epicenter of professional North American motorsport. With that comes easy access to world class engineering, testing and manufacturing resources. M7 is led by CEO Mark Catania, a formally trained mechanical engineer. Mark brings with him 25 years of professional racing experience, including having served as a race engineer, crew chief, engineering manager and R&D director for some of the biggest names in NASCAR Sprint Cup racing. Under new ownership since March of 2013, M7 Tuning is leading the way forward with many new state of the art high performance engine, body and suspension components. Because of the CEO’s lifelong dedication to technology and engineering all design, development and testing is based in-house at M7. We incorporate the latest tools in developing our products including sophisticated laser surface scanning, digital measuring and solid model design. Product manufacturing is being shifted to local suppliers who can offer the latest processes, materials and world class quality. Today more than 90% of M7 Speed products are proudly made in the USA with the goal being 100% American-Made in the not too distant future! Testing and development is conducted at the most advanced automotive test rigs available anywhere. With a number of high quality race tracks only a few hours from M7, full day test events are scheduled to prove M7 parts do what they say they do….make speed! M7 parts are engineered, tested and proven. M7 strives for the highest standards in the performance aftermarket. At the outset of this new era in the history of M7, we acknowledge that the quality of some M7 parts has been an issue in the past but with new ownership, a new base of operation, a new business model, new designs and new resources comes a high M7 quality standard. M7 is committed to providing industry best customer service, technical support, along with both before and after sales assistance. It is company policy that all M7 employees be held to the highest moral and ethical standards. M7 is highly involved in the MINI community, including involvement with many MINI-only events, MINI car clubs, social media sites, our exclusive M7 Ambassador program and MINI web-forums. We don’t just talk MINI at M7, we live it. Every day our motivation is base on three simple, but powerful words; Vision- Passion - Drive. M7 Speed is the Ultimate MINI Performance Company on the Planet... Period! To all of you, from all of us at M7 - Thank you and Happy Motoring!